The market for Linux software-based receiver boxes is continuously growing. What was made popular by Dream Multimedia has now become a much broader market with competition. One of the most successful competitors in the Linux Enigma 2 based receiver market is the Vu+ Duo. What it offers you can discover in this review. VU + Duo is, as its name suggests, a twin tuner model equipped with 2 DVB-S2 tuners for reception of both standard and high definition satellite television. Perhaps you know the Roll Royce of the Enigma 2 boxes, the Dreambox 8000. This box from Vu + is similar in many respects specifications wise. Same CPU type, allow plugins made for Dreambox also to run on this. While there is no possibility for 4 internal tuners like the DM8000, many can probably do without or perhaps add USB tuners instead. The design of the VU + Duo is black with a jog dial on the front to operate the box. In the middle you find a very clear 16 character alphanumeric display that shows what channel you’re watching, filename of the media playing, or time and date in standby. The brightness of the display in standby can be adjusted in the menu. There is no standby button on the box. Behind the front flap to the right we find 2 integrated card readers and 2 Common Interface ports. In addition to this there is a USB connection that can be useful for software update, or if you eg. just want to move some pictures over from a USB key. The front flap was also somewhat difficult to open the first time. The 2 integrated card readers are specified as Conax card readers in the manual. In reality that turned out not to be the case. The built-in card readers require the installation of softcams. If you only got 1 signal from the dish, you can use the menu loop it to the tuner 2, with the limitations that offers. The optimal is of course 2 signals from a twin or Unicable LNB. Some may be missing the physical loop-through option and the option of a coaxial digital audio output, but in general nothing really to be unhappy with, connection wise. A comparison of power consumption on different Linux boxes. 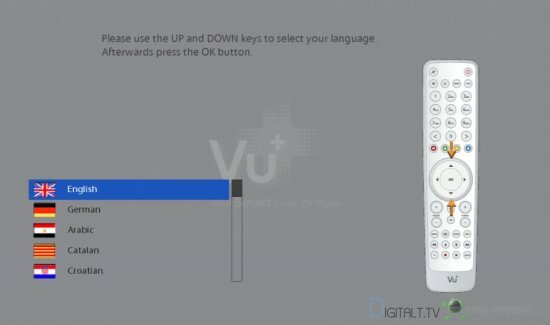 Vu + Duo comes with Enigma2 software installed. Enigma2 opens up numerous possibilities in terms of enhancements and personalization. It is also available in several flavors developed by different developers as Open PLI, VTi and many others. An installation wizard gets you started. You can choose between a number of satellite configurations. In the advanced menu you have control over everything. I could easily configure my DiSEqC 1.1 switch and also my USALS motor. As mentioned earlier, also Unicable LNBs are supported. Like with most Enigma recievers, channel scanning is not fast. You can choose to search all installed satellites, a single satellite or a single frequency. Options like the ability to search for manual PID values and Hardware blind scan are missing though. Using your PC is the easy way to update and edit your channel list. Most users though are probably not using the official stock firmware image. I tried the OpenPli software (using the Magic HD skin) that is as simple to install as an update to the official. Openpli has also a nice wiki for their software that can provide answers to most things. It may require some technical knowledge and interest in seeking answers on the forum, to get it the most out of this box but that is general for all Enigma 2 receivers.The included manual provides answers to the basics, but has some errors. I installed a 500 GB SATA hard drive in the Vu+ Duo. Mounting the hard drive is not difficult, but I have seen easier solutions. Channel zapping is pretty fast and you can of course play around with how the on screen graphics look by downloading and changing skins. Unlike the Clarke Tech ET-9000 or the DM8000, the Vu+ Duo does not offer real live picture in picture. Only I frame PIP is possible due to hardware limitations. The remote is very nice gloss black, and it is quite nice in the hand with the buttons sensibly positioned. There are dedicated buttons for things you could want, and also home and end buttons that can be useful when navigating through long lists. With 2 tuners you can record and watch another program simultaneously. You have the ability to record 2 programs simultaneously, while watching a third program at one of the frequencies which are in use for the recording. Actually, OpenPli software record more than 2 channels simultaneously, as long the are all on the same 2 transponders. Recordings programmed easily via the EPG, or can also be created manually, either as a timer recording or via the record button on the remote. It is possible to set the time buffer for recordings, so you can start a little before and ending shortly after the EPG stated time. The list of recordings can be viewed via a button on the remote. At the time of this review the Vu+ could fast forward and rewind up to x128 normal speed, but only worked at up to x8 speeds. Jump function is available with 15 seconds, 60 seconds or 5 minute intervals. Recordings are saved in. Ts format and can easily be transferred out of the box via FTP. It is also possible to retrieve recordings via the web interface. It is of course also possible to pause live TV. The possibilities with a VU + Duo on your home network are many. As mentioned, you can access the box, and the possible. installed hard drive via FTP, and there is also a web interface on the box that you can get up by typing the ip address box in your browser. 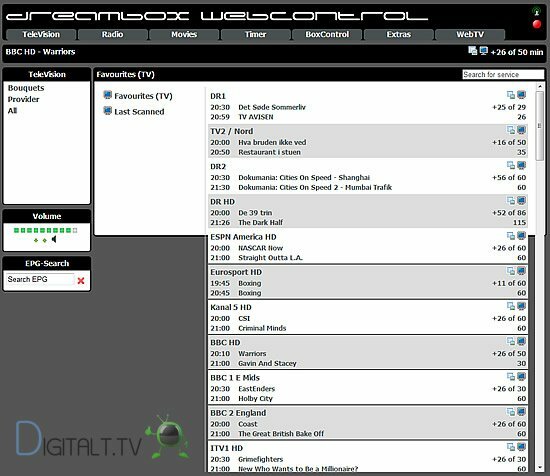 View the EPG and set up recordings via EPG or manually. It is possible to go directly to the Internet Movie Database to search the movie titles in the EPG. You can stream the recordings so you can watch them on your computer directly from your hard drive in the box. Configured correctly, even when you’re away from home, you can enjoy and use your VU + Duo. The Vu+ Duo also serves well as a media player, playing video, music stored on the box hard drive or your home network. Do not expect all file formats to be supported. But common avi, wmv and mkv files are handled pretty well. 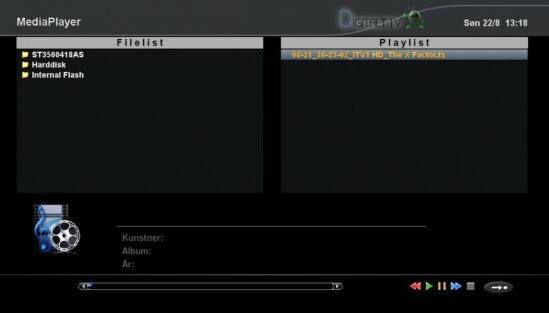 Vu + Duo is a really interesting Linux box, which in many ways compare to the very expensive Dreambox 8000. The Vu + Duo seems fast and stable, which might not have been the case with a advanced receiver like this. The Vu + Duo has a lot to offer and potential to do much more when you add plugins of which there are plenty. Picture quality is not great out of the box but can be tweaked by using the Video Enhancement Plugin.